Teeth damaged by decay, teeth that are misshaped, teeth that are cracked, and teeth that are discolored can negatively affect the aesthetics of a person’s smile. Dental flaws can leave a person feeling self-conscious when smiling. Feelings of insecurity may lead a person to smile less or stop smiling altogether. Unfortunately, some of the treatments used to address these dental issues are easily visible when a person smiles, laughs, or speaks. While effective at treating damage to the teeth, conspicuous dental restorations cannot address flaws affecting the aesthetics of the smile. Fortunately, advances in dental technology have provided treatments that can effectively address dental flaws that affect both the integrity and aesthetics of the teeth. At his cosmetic dentistry practice in Decatur, Dr. Thomas J. Price utilizes porcelain crowns to restore health, stability, and aesthetics to the smile. Porcelain crowns are among the most successful, long-lasting, and versatile dental treatments available today. Designed to reinforce damaged teeth, dental crowns are shaped like teeth and encompass the entire surface of the tooth. Dental crowns may be used to restore the function and aesthetic of damaged or decayed teeth. Dental crowns can be made from a variety of materials including metals and porcelain. Porcelain offers advantages that metals cannot provide. One of the greatest advantages of porcelain is that it can be sculpted to match the look of the remaining natural teeth. Porcelain crowns can be used to enhance the function, strength, and aesthetics of a patient’s smile. Porcelain crowns are incredibly versatile. They may be used to stabilize teeth that are cracked, protect weakened teeth and teeth that are at risk of cracking. Porcelain crowns may also be used to cover aesthetic flaws such as teeth that are misshaped or discolored. Porcelain crowns may be used to top dental implants and support dental bridges. The versatility of porcelain crowns makes them an excellent treatment option for many patients. Dental patients affected by severe tooth decay or tooth damage may benefit from porcelain crowns. Patients that are suffering from decay or damage to the teeth and that have adequate tooth structure make the best candidates for porcelain crowns. Pain, discomfort, and sensitivity are common side effects of decayed and damaged teeth. A tooth that is severely decayed or damaged can impair a person’s ability to eat, drink, and speak. With porcelain crowns, a person’s ability to easily perform the routine daily functions of eating, drinking, and speaking can be restored. Porcelain crowns are specially designed to blend in seamlessly with the natural teeth within a person’s smile. After being placed, porcelain crowns are virtually undetectable. 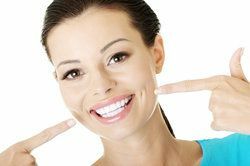 Porcelain crowns can enhance a person’s smile. By covering aesthetic flaws in the teeth with porcelain crowns, the appearance and function of a patient’s smile can be enhanced. The strength, durability, stability, versatility, and enhanced aesthetics provided by porcelain crowns make them an excellent treatment for many dental problems. If you would like to learn more about the benefits of porcelain crowns, please contact Georgia Dental Center today.